I’ve so many posts that haven’t even made draft yet, just bubbling away in my head. Maybe listing them here will halp. At least it’s got me away from Pinkerton my Facebook pet Greybit. He’s less than an hour old, but at level 6 and loves fighting level 7 spiders and mantises and stuff. Want to blog today but no can do as the Perfect Path editing suite is at capacity working on the rest of the videos from Second Chance Tuesday and a top-secret super hush-hush and really quite evil thing which may or may not be related to this. 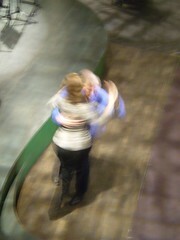 Very nice Social Media Club meetup last night, not least because I met Rupert Howe, who rocks. Prolly see you after the weekend. No I’m not using adwords on this site, but I wanted to share the selection that came up on a ning social network I’ve just set up for SMC London. All there is on the page for reference is my picture and an introductory post from me, and the title with strap “If you get it, share it (in London! )” which still doesn’t quite explain (at least to me) the link to gay bikini wearing chauffeurs with ringworm. Btw, of course, if you’re interested in joining the network and thereby generating some more relevant advertising, please do get over there and sign up. The London experiment with weekly media-making meetups continued this evening with another member getting his first taste of videoblogging. Guy West has been a regular at our discussion groups and kindly recorded some audio at one of the meetings. We sat in the brand new foyer of the British Film Institute/National Film Theatre which only opened last week and chatted about our social use of the internet. I was showing off a bit pointing the camera in my general direction which results in the people standing behind me being beautifully in focus, but my face (some will no doubt say this is a blessing) is a bit blurry. No Palme D’or for this one, but at least we had some footage – and it wasn’t just of me! I showed Guy how to transfer from the camera to PC and then do some simple editing tasks and then we topped and tailed it with some titles and credits. We’d stood around for long enough, occasionally getting odd stares from the patrons of the Lesbian & Gay film festival that’s currently running there so I didn’t make Guy watch while we uploaded it to YouTube – he knew how to do that bit anyway.Next week the clocks will have gone forward, we’ll be into British Summer Time, and hopefully it will be a bit warmer for our first Blogwalk. 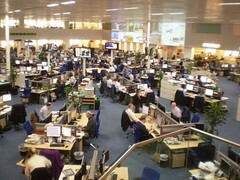 This is the new Daily Telegraph news room which I had the privilege of seeing at the end of last week. I’d seen the bit on BBC News the other week where some poor Torygraph hack was shown having to make a podcast and video interview in addition to writing a story and complaining that this meant he didn’t have the lunches he’d been used to, but I’d forgotten until I started writing this that ironically for such a bastion of the establishment, the Telegraph was remarkable for being one of the first papers on the web. Nice to meet Shane Richmond & Ian Douglas and interesting to think about the new premises as a possible venue for a Social Media Club. OK, so my bright idea was a little under-attended last week (yes, I was the only one to turn up) but nevertheless I did one of the things I set out to do which was to make some media. Tonight we had a 500% increase in the number of attendees and half of the people who came along can be heard in the podcast we made! I met up with Ronna Porter (who’s going to lead our discussion group meeting next week) in the foyer of the National Theatre on London’s South Bank. To show her just how easy making a podcast could be, I set up my gear and she set up the gear that she’d borrowed for the night and off we went. We talked a lot about the use of sound and music in advertising and PR and my views on podcasting. A little way in, we were joined by Lars Plougmann, whose contribution, you’ll hear, was repeatedly interrupted by his three friends ringing him to find out where we were. Sadly there aren’t as many massage parlours in this centre of cultural excellence as Chris, Howard and Debbie found in Las Vegas earlier but then they didn’t have a tango band in the background. I was the only one who’d any experience of podcasting so I showed everyone how simply the file was transferred to my laptop, edited and put through the compressor in Audacity and then exported to mp3. I wasn’t able to upload it to my podcast server while they watched as the large amounts of concrete in the National kept us disconnected from the ThamesOnline network. Ronna kept her recorder running while we did this latter part so there may be another podcast to follow! There was quite a bit of discussion about discoverability, tagging and allowing users to create the metadata they need, rather than trying to control it as a creator. So next week we return to the 3rd Thursday discussion group indoors with beers and nibbles format but on 22nd we’ll be out and about again, this time with our video cameras teaching each other about video-blogging – watch the wiki page for details. Tonight, 8th March, we will be getting together for our 2nd Thursday weekly meetup at 6pm to talk and share practice around podcasting & audioblogging. I’m suggesting meeting up in the foyer of the National Theatre on the South Bank – we should be able to find somewhere quiet enough to practice recording, but it’s not so quiet and intimate that we will disturb others. I will have my portable recording kit, feel free to bring your own. Do let me know if you are intending to come, feel free to bring anyone along who might be interested or tell a friend (or indeed your worst enemy) to come along. Also do let me know if you want me to shut up about bloody social media club.